While operating a food cart may seem simple, it takes street smarts to hurdle the start-up obstacles. 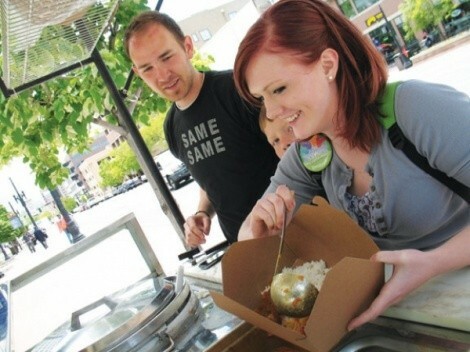 For The Curryer’s Kim Pettit, who started downtown Salt Lake City’s only Indian food cart in April, that included an initial dislike for the type of food she serves. And then there’s the roughly 7,000 miles separating Pettit from her personal and professional partner, Dustin Romero. Pettit first tried Indian food only a year ago. And she hated it. With time, she developed a taste for the cuisine, though, so she bought 15 cookbooks and studied hard in preparation to open a food truck. Then hard luck struck. The retro truck Pettit and Romero bought blew its engine on The Curryer’s maiden voyage. Then Romero was deployed for duty in Iraq in June 2010. Inauspicious beginnings, to be certain. But while chatting over Skype, the pair decided to gamble on a used hot dog cart, which was customized with a tandoori oven and rice cooker. “Even now, once we work a problem out, there’s always something new,” Pettit says. There are flat tires and rice shortages. And there are misunderstandings by potential customers. “We get a lot of people thinking that we sell hot dogs,” she says, smiling. Romero is scheduled to return stateside in June, and The Curryer’s kinks are more or less getting unkinked. So the focus is, as it should be, on curry: Americanized, but delicious, especially for street fare. Since opening, Pettit has concocted roughly 60 recipes, all served over rice with naan, with two daily dishes, including favorites aloo matar, vindaloo and chicken curry. However, one obstacle remains: the weather. “We don’t open when it’s raining because the clay tandoori oven will crack, getting clay on the naan. And if it’s too windy, the fire will eat my face,” she says.